I shot over 6000 photos in five weeks. Don’t panic. I’m not going to show them all to you here. Instead I’ve chosen 30 portraits. 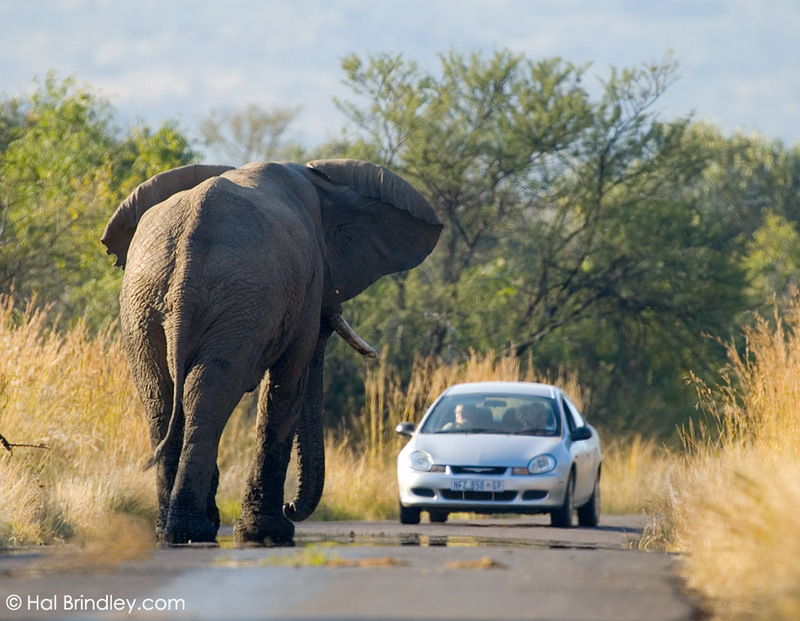 This is just a taste of the incredible variety of animals I encountered while driving around the national parks of South Africa. 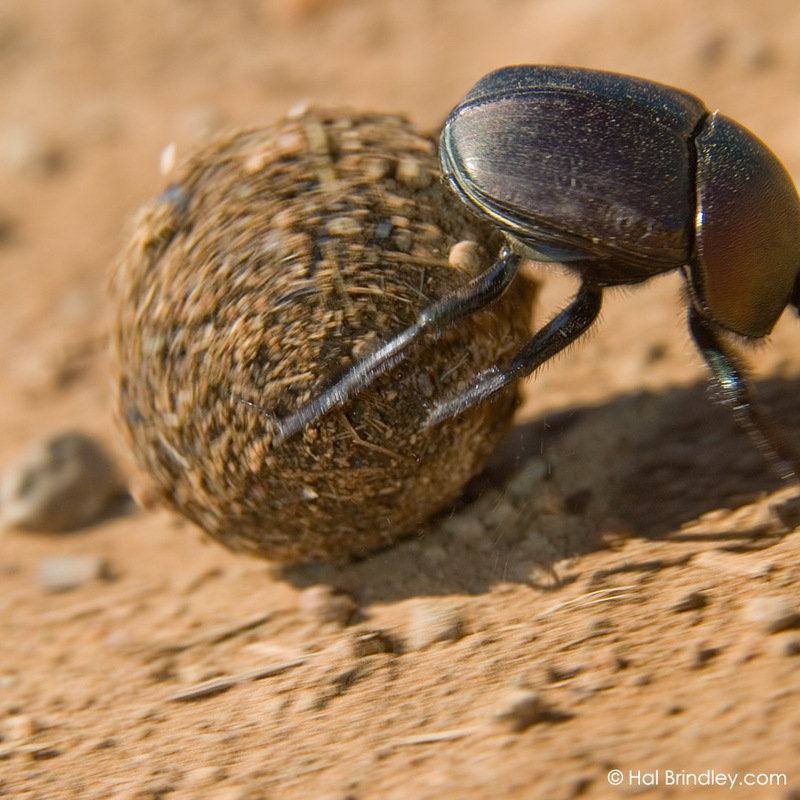 This dung beetle is designing a nursery for her baby. Now she is rolling it away to a safe place, where she will lay a single egg inside and then bury it. When the larvae hatches, it is surrounded by food! 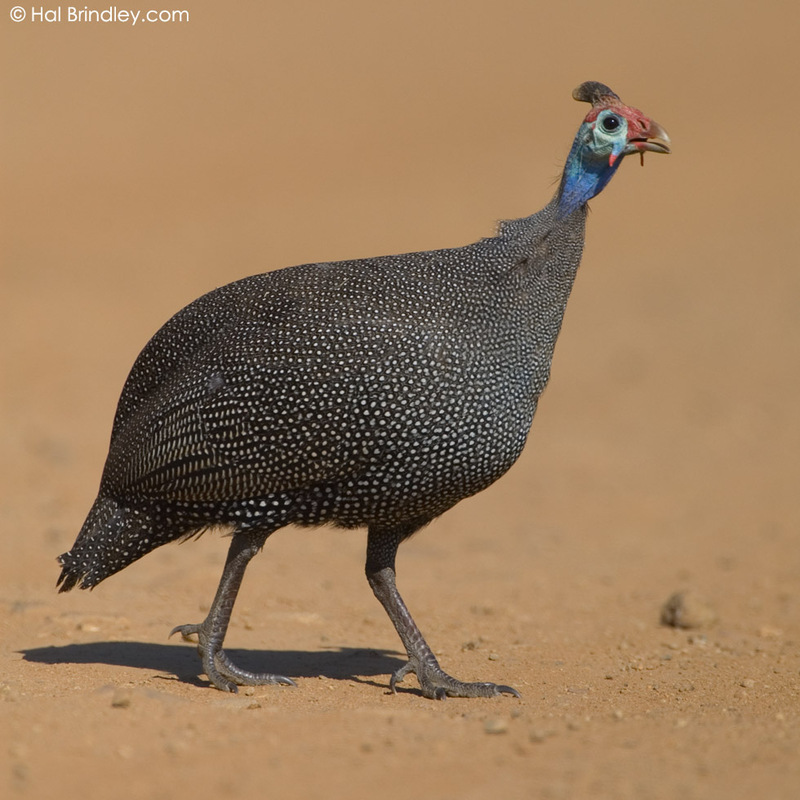 This exotic-looking bird is a common resident of Kruger National Park. 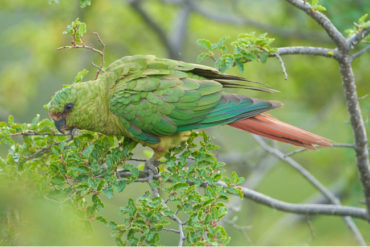 It has developed a very large bill, similar in design to those of the toucans of Central America. An example of convergent evolution. Here we have three cubs wandering around in Kruger National Park. I pulled over to watch them and one came up to my car, sniffing each of the tires. It looked up at me with a curious expression, right next to my open window. Then their mother came to round them up. 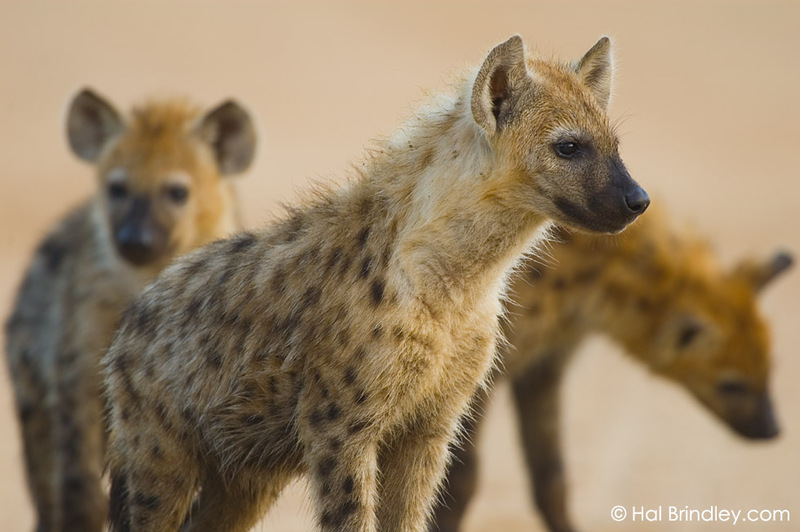 Strangely enough, hyenas are considered to be more closely related to cats than dogs. 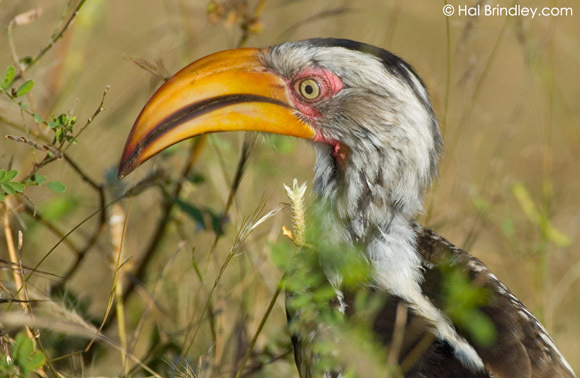 This is one of the most beautiful ugly birds in Africa. I would often see large flocks wandering in the roads during my early morning drives. This is the world’s second largest land animal, after elephants. 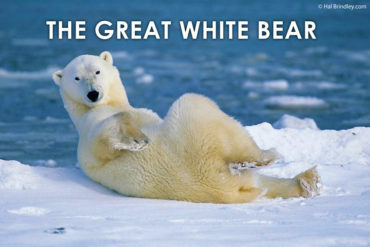 An adult male can weigh up to 7,000 pounds. This yawning baby may look tiny but I bet it weighs more than you do. 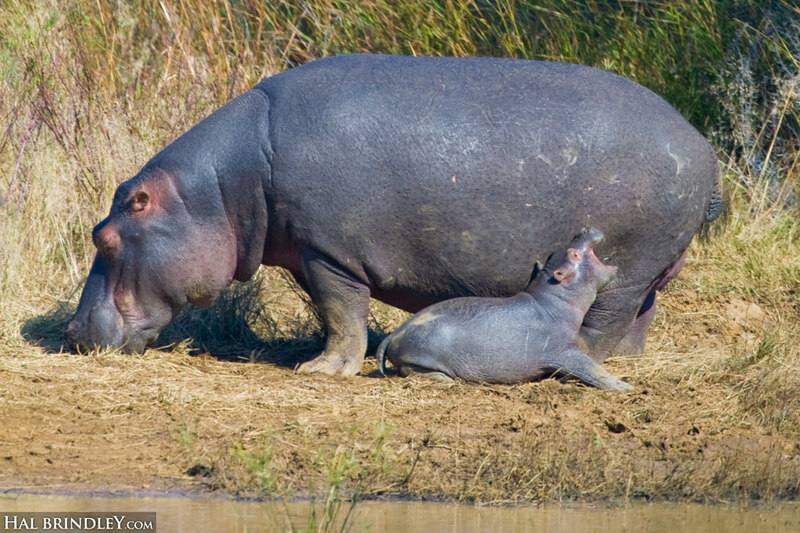 Interesting fact: Hippos are the most dangerous animal in Africa. Although they are completely herbivorous, they are responsible for more human deaths per year than any other creature on the continent. Try not to surprise one when it is grazing in the middle of the night. #7 – the Southern White Rhinoceros. The third largest land animal on the planet. It might seem like a dangerous postion to be in, looking down the barrel of a full grown rhino. 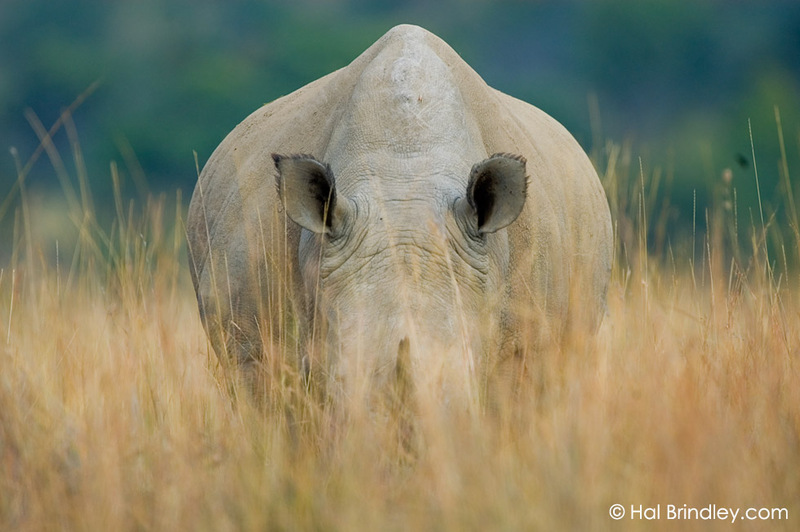 But this species is not nearly as likely to charge as its smaller cousin, the black rhino. The Southern White Rhino was on the brink of extinction in the early 1900’s, only a few dozen remained. 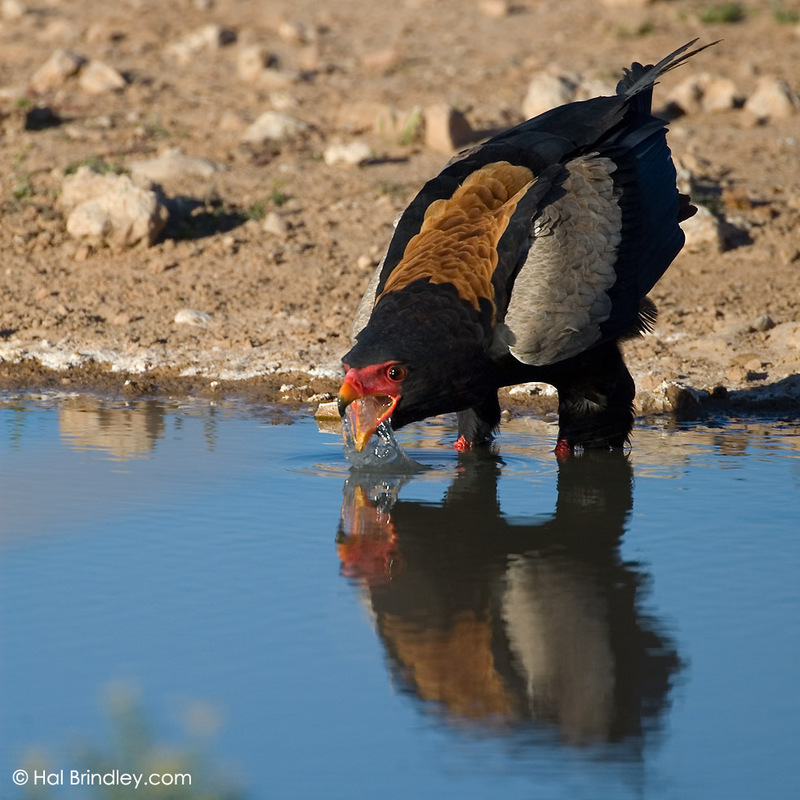 Now, thanks to a reserve in South Africa, their population has rebounded to roughly 8000 individuals. In Kruger National Park this was the most common animal I saw. After a few days I found myself saying, “oh it’s just an impala”. Funny how we tend to devalue an animal just because it happens to be surviving incredibly well. Lesson: don’t forget to stop and admire the impalas. These little buddies are a real treat to watch. They live in large family groups and scamper around their rocky homes with amazing agility. Although they may look like big rodents, they are actually considered by most to be “subungulates”. This means their closest living relative is none other than … the elephant! 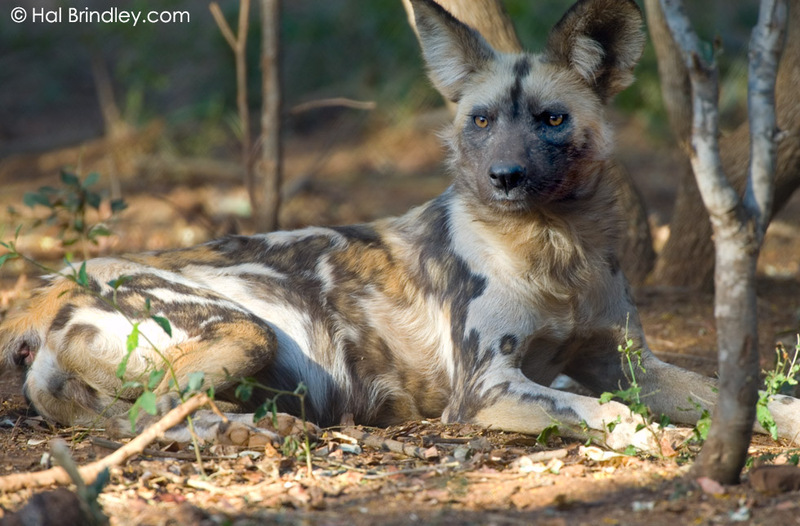 I saw my first African Wild Dogs (also known as the African Painted Dog) during this trip. Unfortunately it is one of Africa’s most endangered carnivores. I photographed this individual at the De Wildt reserve. 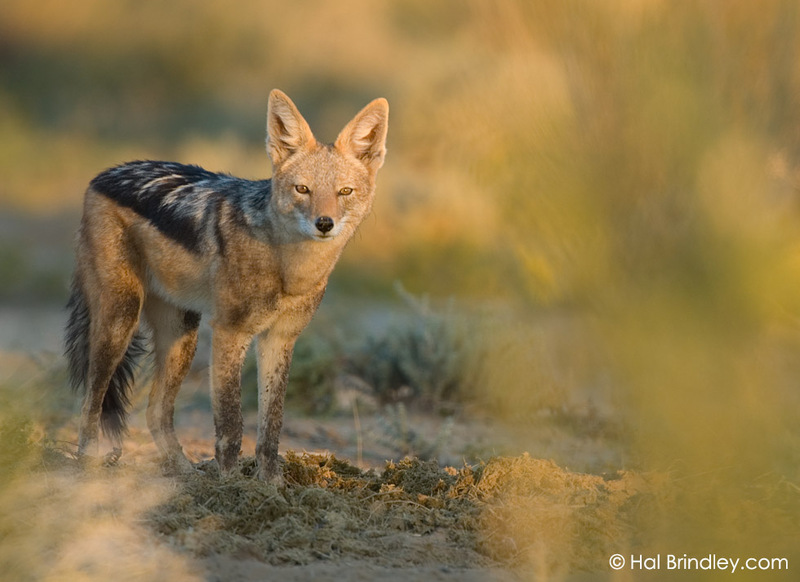 Here the endangered wild dogs are bred in captivity and then released into other parks and reserves. When we first saw one of these we dubbed it “the old lady in biker shorts”. This eagle-like raptor wanders around and literally punches snakes to death with its feet balled up into fists. The name was given to it in an era when secretaries would stick quill pens in their hair. 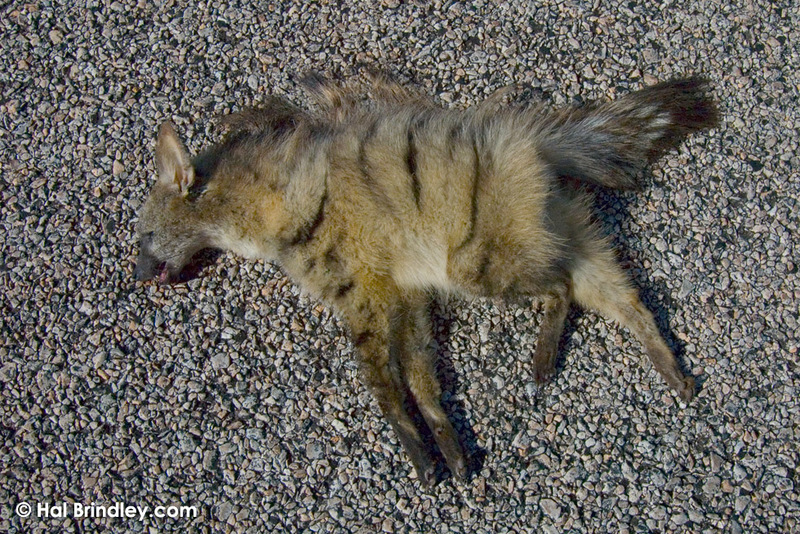 The Aardwolf is a member of the hyena family. The strange thing is that this hyena makes a living by eating termites. Aardwolves may eat up to 200,000 termites a night, lapping them up as they emerge from their mounds. I have never seen one alive. 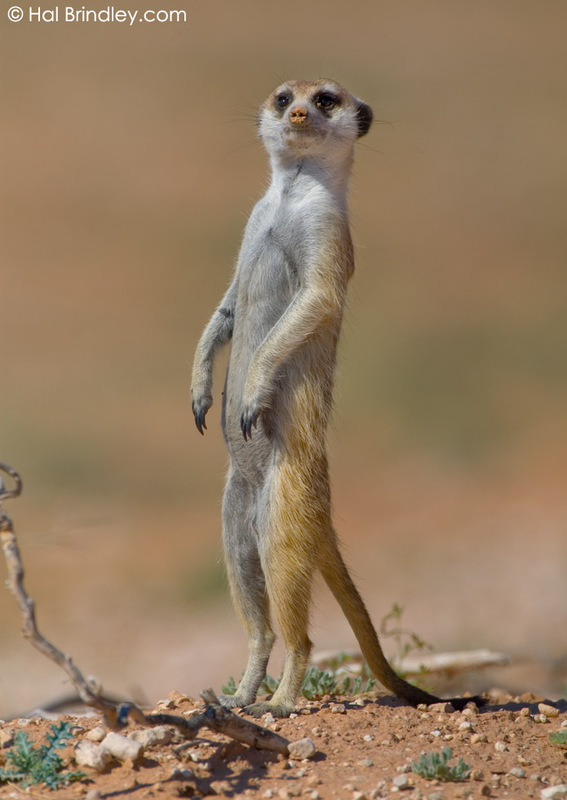 This individual was killed on a road in the Kalahari. Does this name seem familiar to you? It should. 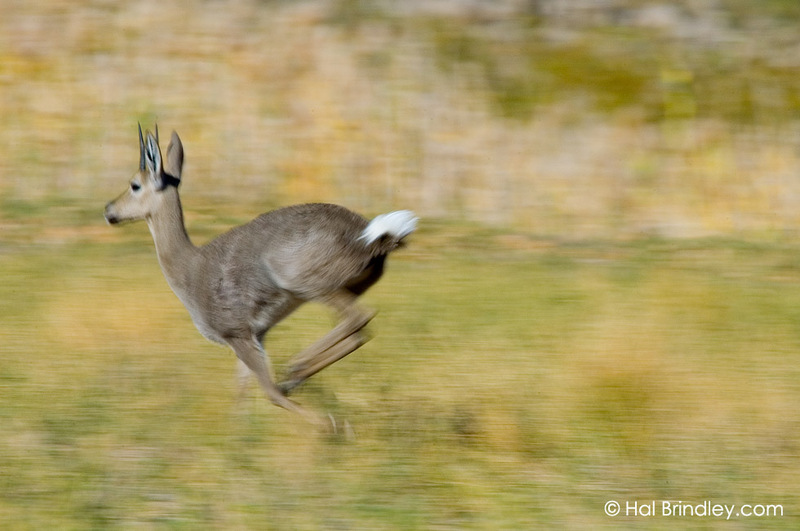 A large sporting goods company named itself after this swift little antelope. You guessed it, Reebok. 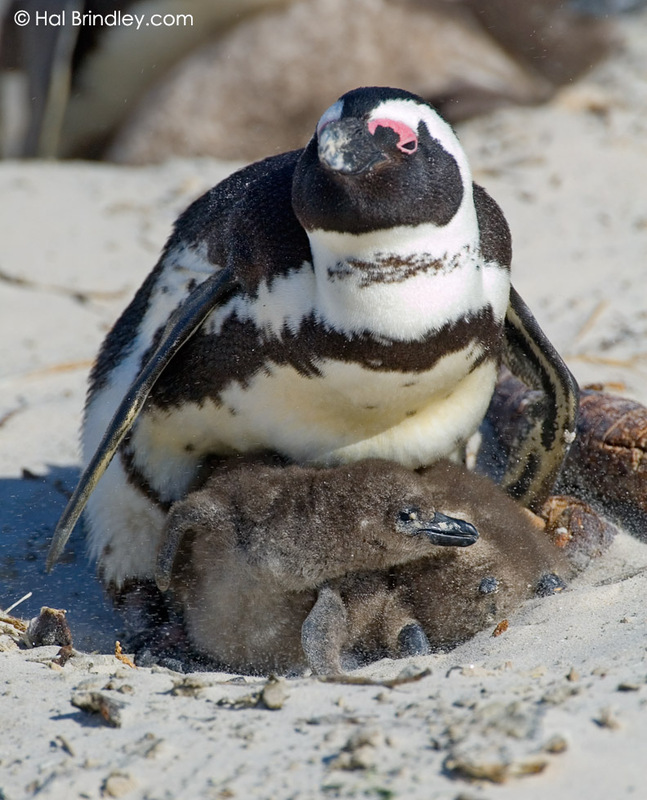 There are only two mainland breeding colonies of African penguins. 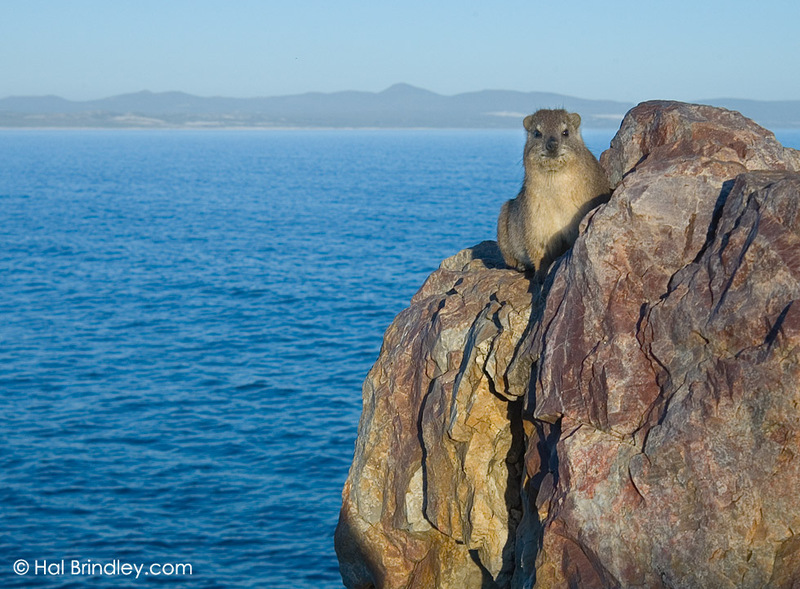 I photographed this little family on Boulders Beach. The adult is trying to protect its pudgy babies from from being sand-blasted. 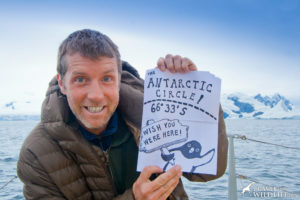 These penguins must have a world class public relations team. Only a decade ago they were known by a less flattering but much more entertaining name; the Jackass Penguin. When you approach a colony you realize how appropriate this name is. Their ear-piercing, donkey-like braying is hard to forget. I don’t understand how the name Jackal came to have a negative connotation. I love these guys. Sure this particular one happens to be feeding in a large pile of dung, but that happens to the best of us every now and then, doesn’t it? 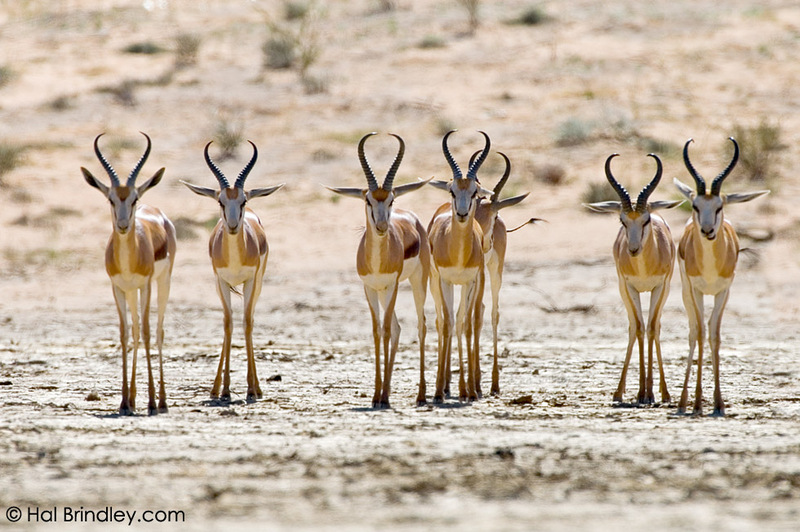 Springboks are a common resident of the Kalahari. 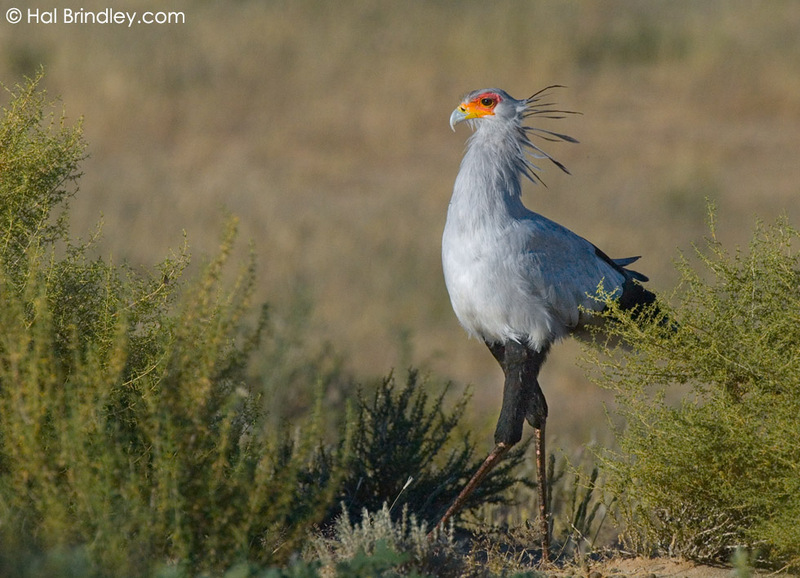 They are named for their incredible spring-like abilty to bounce straight-legged, up to 10 feet in the air. 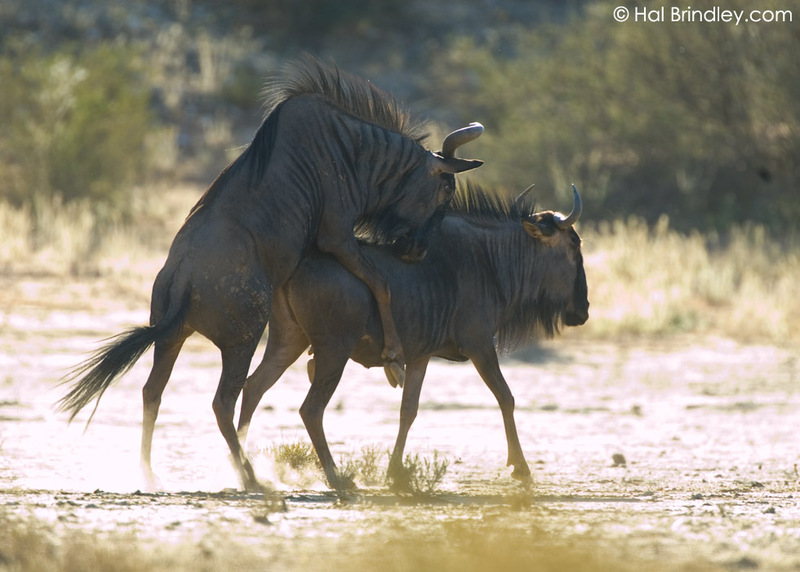 This type of locomotion is known as pronking or stotting. I watched this mongoose for about 15 minutes and observed a behavior that I had previously seen only among cats. She was playing with her food. She picked up this lizard, then layed it down and gently poked and prodded it with her paws. When the terrified little lizard finally got the nerve to run, the mongoose gave chase, pounced on it, picked it up, and started the process over again. 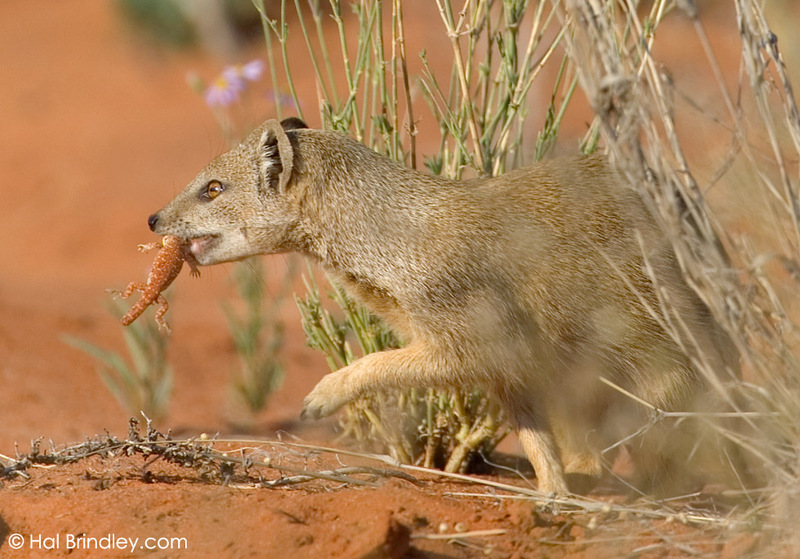 After 6 or 7 rounds, the mongoose got bored of her game and devoured the poor thing. This photo displays two of the lizard’s survival techniques. One, its amazing camouflage which perfectly matches the color and texture of the red Kalahari sand, and two, the ability to shed its tail when under attack. Nice try lizard. 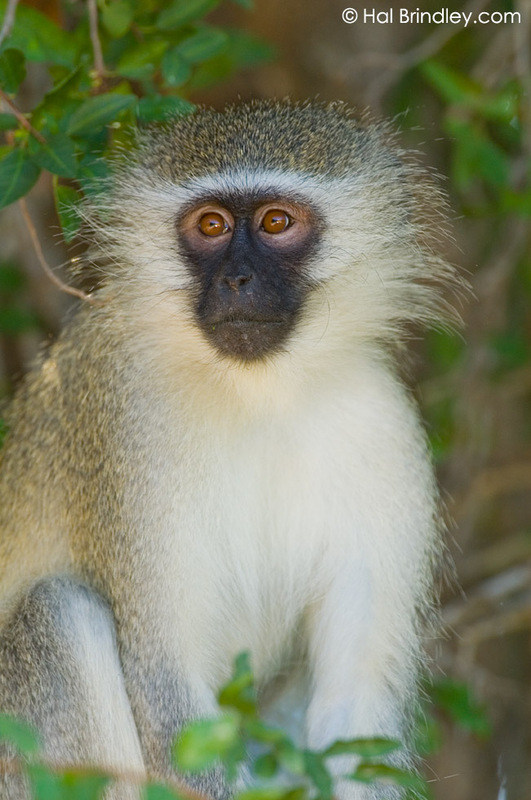 I could say lots of good things about Vervet Monkeys but let me just say this. They have incredibly bright blue-colored testicles. 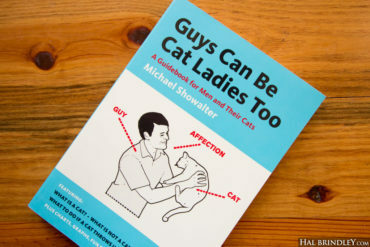 As if it were a scientifically proven fact. It doesn’t actually say that. If you travel in South Africa you will constantly be bombarded with the phrase “the Big Five”. 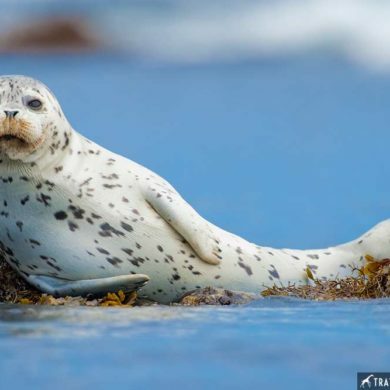 These are the five animals that everyone is trying to spot. It is a carry-over from the days of big game hunting when these were considered the five most dangerous big trophy animals. The first four: Elephant, Rhino, Lion, and Leopard I can understand. But number five always stumped me. The Buffalo. It’s a big cow that stands around in groups consisting of up to several thousand animals. How challenging could that be? No offense to this little calf. 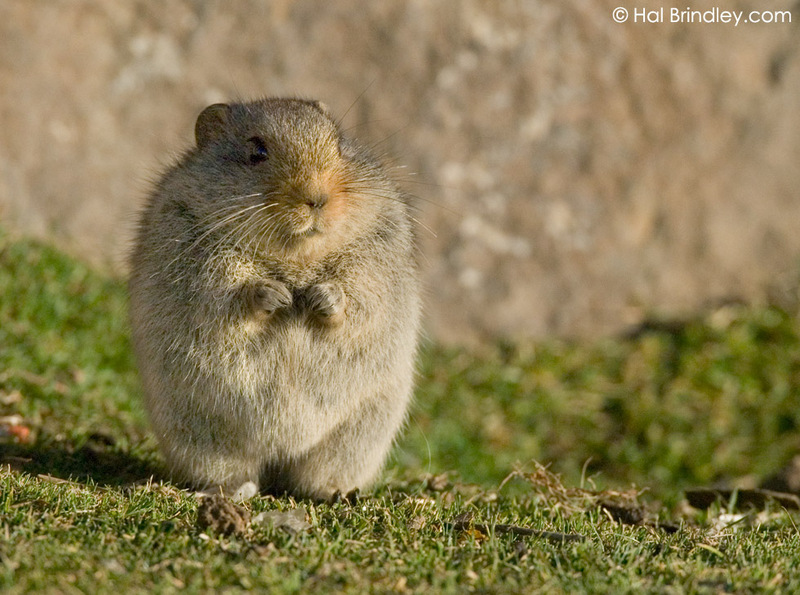 These fat little fur-balls appear to be related to the dancing groundhog featured in the movie Caddyshack. It is the only wildlife I photographed in the country of Lesotho. We were high in the Drakensberg Mountains and these little guys popped out of the stone walls as the sun came up. I’ve been trying to think of a tasteful way to describe this photograph. Perhaps “The Circle of Life”. The wilderness isn’t as wild as it used to be. 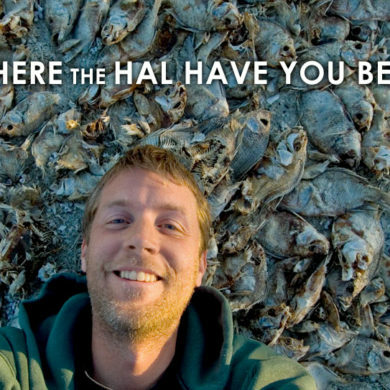 For many animals the choice is to either adapt to the spreading human population or die. Every now and then, humans give their wild cousins a little break. 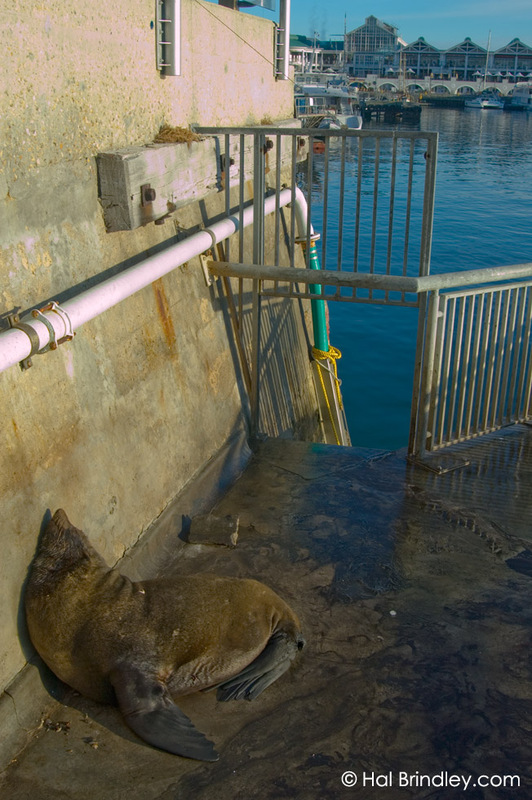 A small concrete area was built right in the middle of the busiest harbor in Cape Town so that Cape Fur Seals could have a safe place to haul out and relax. There was a dirt road in the Kalahari that I drove several times a day for a week. 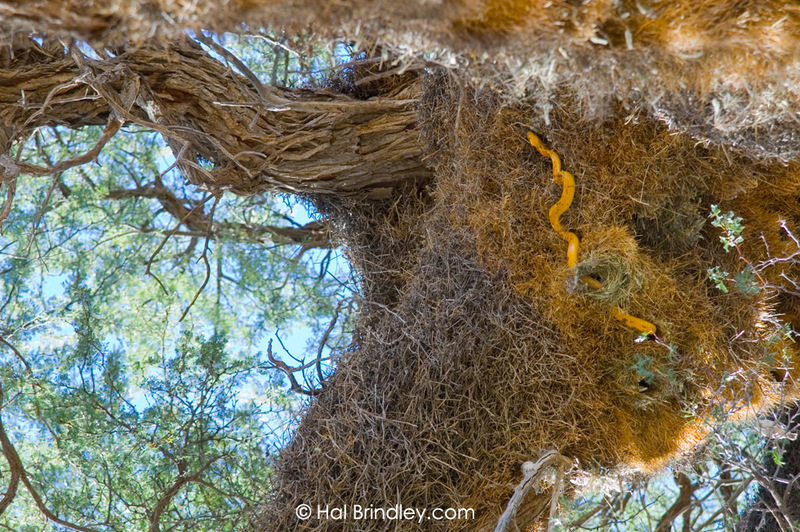 It passed under a large tree full of giant communal nests made by Sociable Weaver birds. One day I looked up and saw no less than THREE bright yellow cobras weaving in and out of the holes. I shot this photo with my head leaning back out of my car window, looking straight up at the underside of one of the nests. When I first pulled to a stop beneath it, this 6 foot cobra leaned down and flared its neck hood at me in a threat display. All it had to do was let go and fall directly on my face. I had nightmares for weeks. 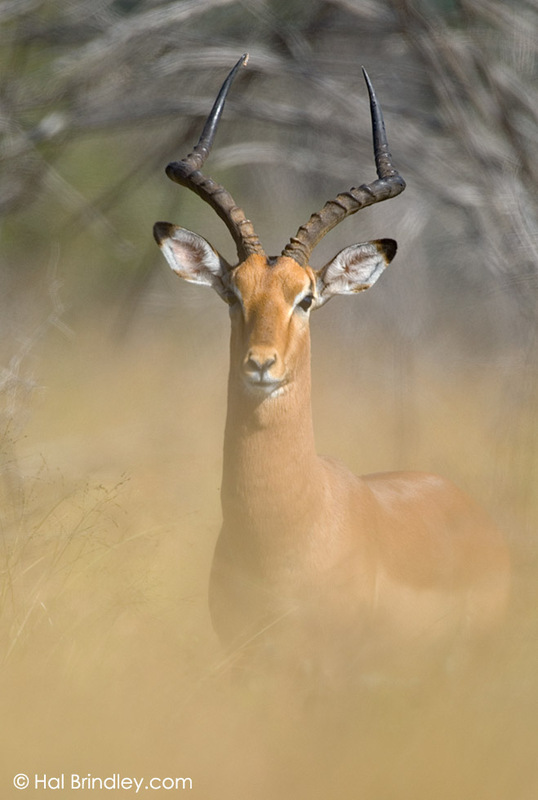 The tallest animal on the planet by a long shot, a male can be as high as 18 feet at the top of its horns. Humans have a mere seven vertebrae in their neck. 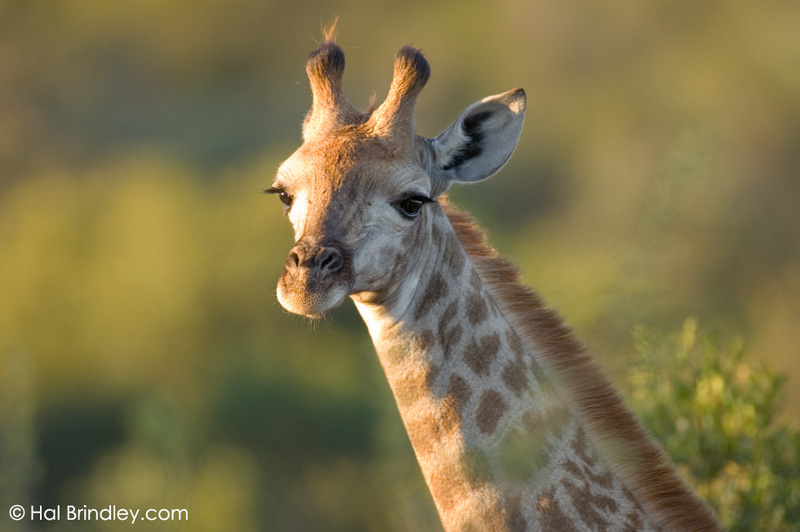 Take a wild guess how many a giraffe has? Seven. The same as almost every mammal on the planet. Give yourself a few million years of selective evolution and you too could have an eight foot long neck. This one isn’t nearly that tall. It’s just a youngster. 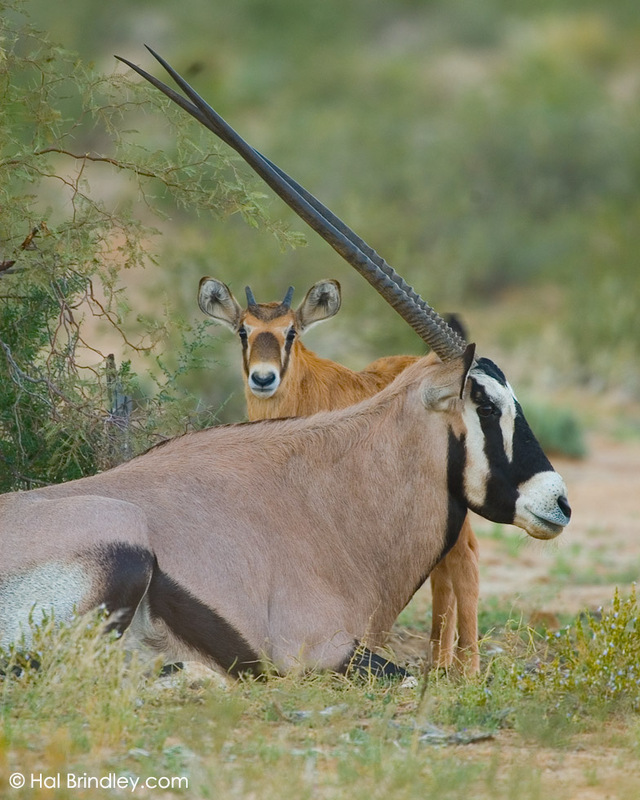 Personally, I think the Gemsbok is the sportiest looking antelope in Africa. 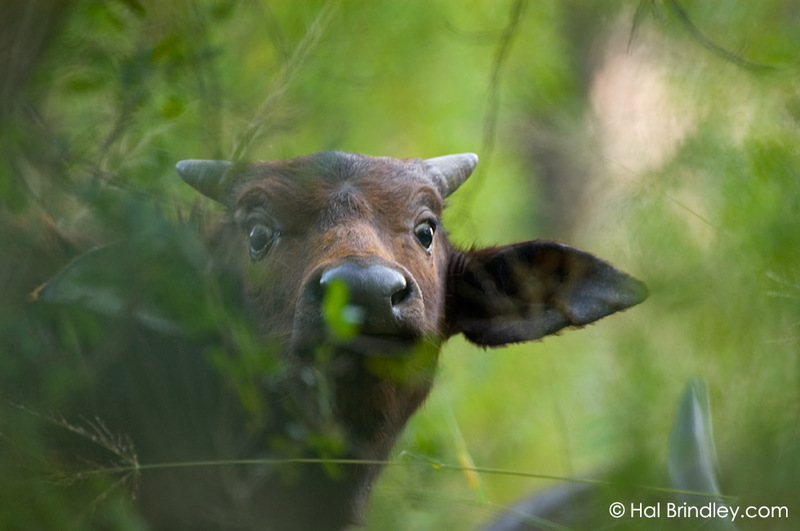 I photographed this young calf hiding behind its parent just before sunrise in the Kalahari. The cheetah is the fastest land animal in the world. Recent tests have clocked it at 76 miles per hour. Wow. 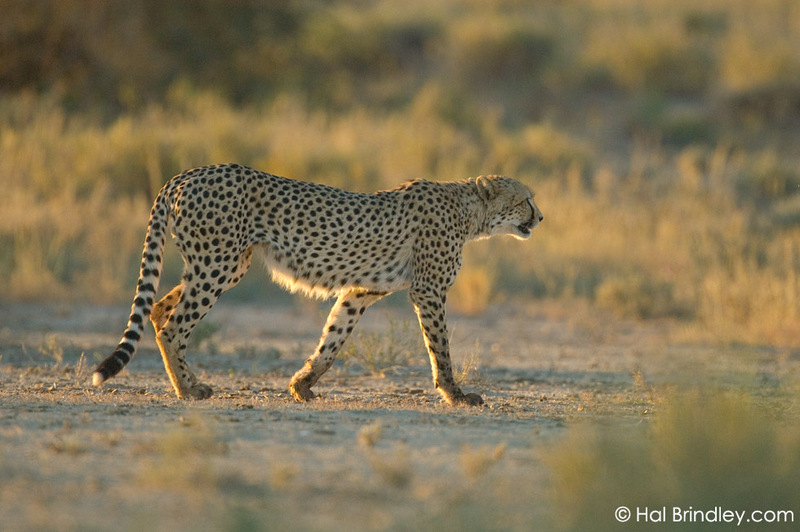 My first night in the Kalahari I witnessed two cheetahs strolling through their territory. They walked single file, parallel to the road. I drove along with them for 20 minutes shooting them in the glowing light of sunset. This was such a thrilling moment for me I almost peed my pants. These charming little mongooses are considered to be some of the most cooperative animals on the planet. 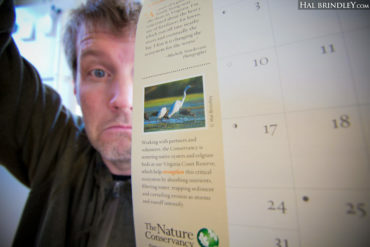 Shown here is an example. 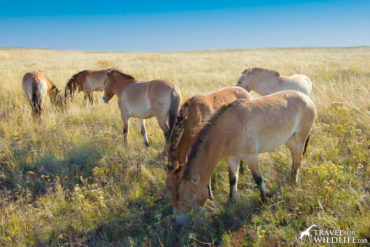 One member of the group will choose a high patch of ground and act as lookout while the rest forage for food. Note: this fellow might look like it has a pink pig snout but on closer examination I realized that it is actually red sand stuck to its moist little black nose. Check out that kickstand too. 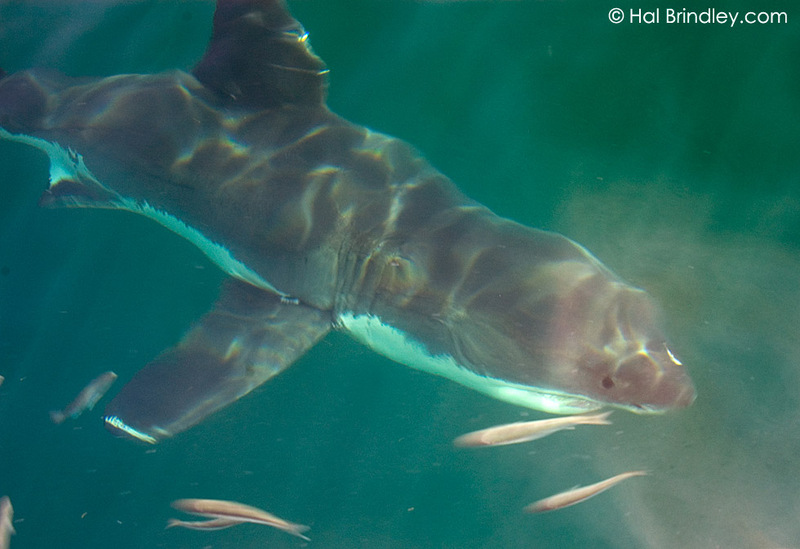 I went on a Great White Shark cage diving tour near Dyer Island off the coast of South Africa. Unfortunately I was running a high temperature that day from tick bite fever. After spending 20 minutes in the cage, the freezing cold water and my uncontrollable shivers forced me out. I never saw a shark from under water during that time. By the end of the trip, however, we saw at least a dozen. The largest was this 15 foot female whIch I photographed from the surface. I thought it would be terrifying. 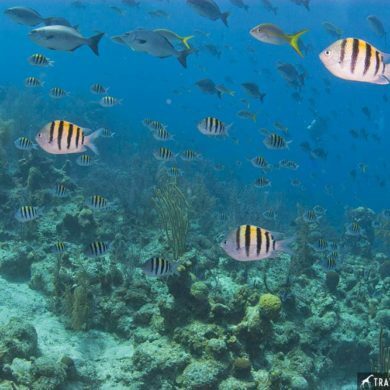 It turned out I was simply awestruck by the beauty and power of these perfect predators. The only other two people on the boat with me were a couple from Namibia. They refused to get in the cage. *Note. After competing this tour I came to the conclusion that the great white shark tour business was not in the best interest of shark conservation. 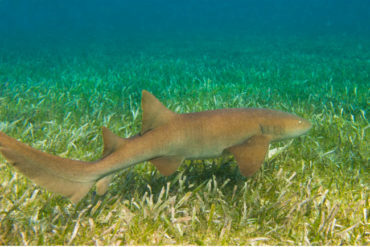 Feeding sharks with humans around will (in my opinion) lead to sharks associating people with food. This will cause unpleasant interactions between sharks and humans, and ultimately more shark deaths. Yes it allows people to observe and appreciate these animals up close. But isn’t there a better way? Finally, I present to you my favorite encounter of the entire journey. 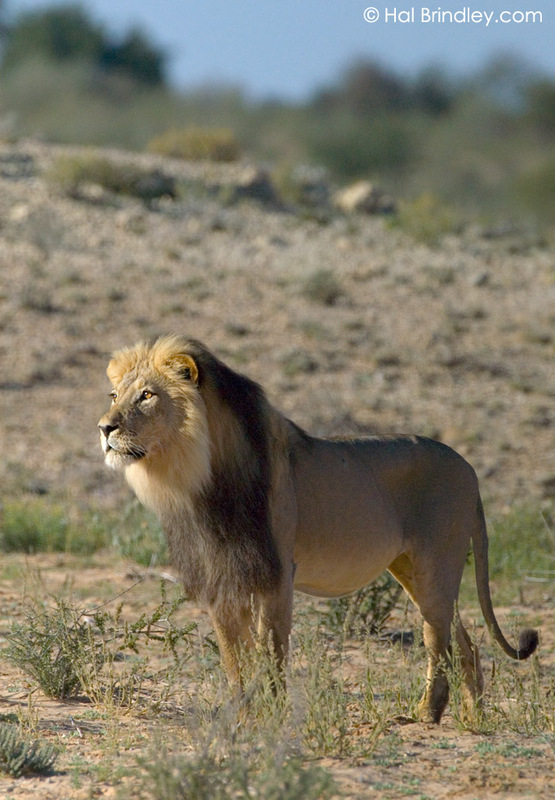 My first Kalahari lions. 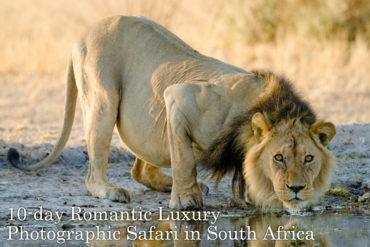 They are considered to be some of the most beautiful in Africa with their dark luxurious manes. I could definitely see one appearing in a Pantene commercial. I came across these two large males early one morning. They were walking along at a relaxed pace until suddenly, all three of us heard a roar in the distance. They stopped dead still, raised their heads high and glared. They charged off in the direction of the sound, roaring back. I followed them for almost an hour when finally they discovered an intruder. This photo shows the precise moment when we all first spotted the culprit in the distance. It was a female. Perhaps I’m inferring a little too much here but I noticed a subtle change of expression on their faces. Something akin to adoration. The ensuing encounter, although there was never any contact between them, allowed me to shoot some of the best close up lion portraits I could ever have hoped for. 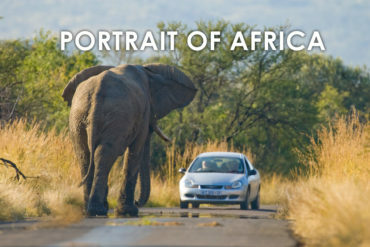 Those are my thirty portraits of Africa. Hope you enjoyed it. Oh yeah, here’s a bonus for you. 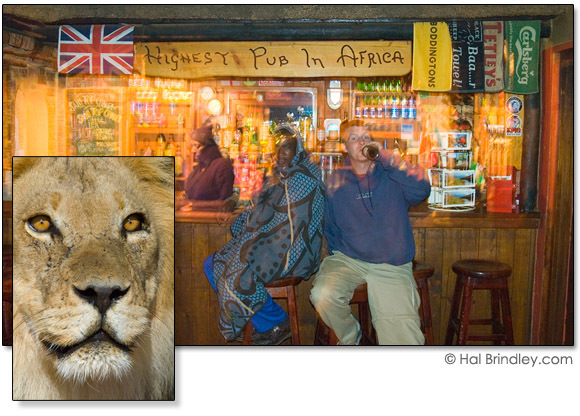 It’s me having a beer at the highest pub in Africa. Woo-hoo! Stunningly magnificent photographs! Probably I’ll never visit South Africa in my lifetime but your wonderful photographs allow me to admire the details of creatures that I would likely never otherwise see. Thanks!